The Ohio man was nabbed yesterday morning for "abusing harmful intoxicants" as he attempted to make a purchase at Bellaire's Dollar General Store. The 41-year-old Tribett, it seems, had been huffing spray paint and needed a refill. According to a Bellaire Police Department report, Tribett's pupils were constricted and he replied slowly to their questions. 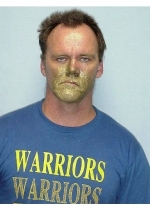 Oh, and "officers observed the paint on face and hands," as can be seen in this mug shot. Submitted by Buford on Tue, 2011-04-26 17:02. Submitted by MerryLynching on Tue, 2011-04-26 14:08. Our nation's Constitution contains the right to huff. It's right there next to the right to kill your children before they're born. 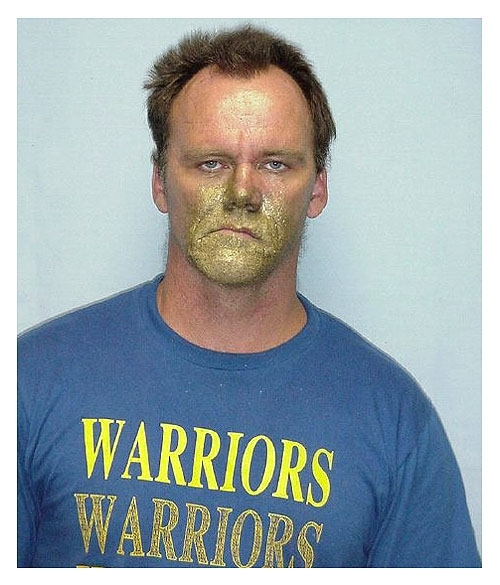 Paint huffing must remain safe and legal. You conservatives would turn back the clock, forcing these distraught and despairing unemployed young Obama voters to the back alley behind the paint store, dumpster diving for the last remnants of paint fumes from dented cans whose caps are missing. Think for a minute, cruel and heartless conservatives: What if they break a fingernail trying to push down on the capless plastic pistons? Submitted by MerryLynching on Tue, 2011-04-26 14:07. Submitted by Buford on Mon, 2011-04-25 16:31. Submitted by Mo Ma' on Sat, 2011-04-23 14:32. Submitted by Eke on Sun, 2011-04-24 03:34. Doesn't that take two cans?